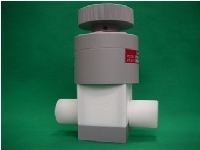 H valve is a bellows type, the liquid contacting parts of which are all made of PTFE, superior in the resistance against chemicals and in durability, and thus suitable to processes of medicines and semiconductors. 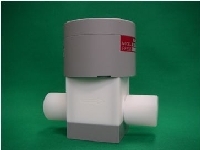 It can be used for high pressure specification, when it is provided with additional bias pressure. When the lipuid pressure exceeds 0.25Mpa, the bias pressure shall be added. The disk part is with the structure of a cap and screwing, and can be easily replaced. Sealing is reliable and of long-life. Since the disk is of a sheet surface, no dust will be produced. As the driving part of the room temperature-type is protected with a hard　PVC cover, it can be installed even in unfavorable environment. The cover on the driving part of the heat-resistant type is made of metal with 4F coating, in order to provide corrosion resistance as well as heat resistance. The maintenance will be conducted at ease, since the connectiing part is the fitting unified type, which has no chance of leakage at screws. Copyright (C) 2008 株式会社ハルナ All Rights Reserved.